L-R: Andrew Hetherington, CEO Business to Arts, Minister Pascal Donoghue, T.D., Catherine Ann Cullen, A&LG Writer in Residence, Sinead Smith, Corporate Responsibility Manager, A&LG and Sean McGrath, CEO Allianz. 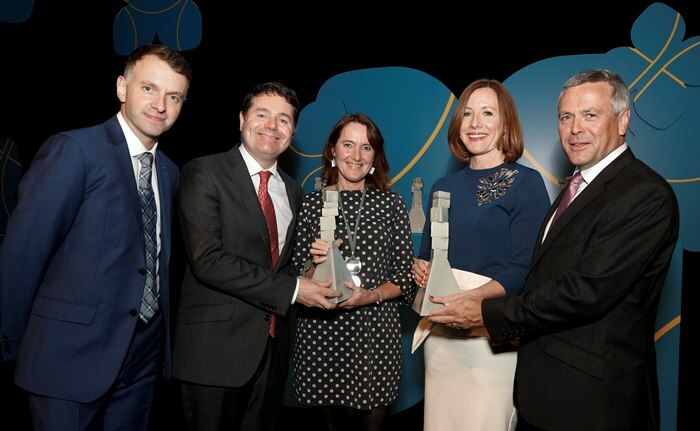 The A&L Goodbody Writer in Residence Programme with Catherine Ann Cullen is unique in Ireland and its success has been recognised with the winning of the Best Use of Creativity in the Community category at the Business to Arts Awards ceremony in Dublin. The Programme, run by Business to Arts and Dublin City Council, places a professional writer into an inner city school with the aim of improving literacy skills among pupils. The venture marks the first time that a business in Ireland has engaged a Writer in Residence with Business to Arts. As part of the partnership, A&L Goodbody provides funding, administrative and promotional support. In October 2016 Catherine Ann Cullen, a children's author and poet, was selected as the professional writer. Since October Catherine Ann has been working with third and fourth class pupils at St Joseph's Co-ed Primary School in Dublin's East Wall with the aim of improving their writing and reading skills. Teachers report that the pupils involved in the programme are enjoying reading more, are much more confident about reading out loud and coming up with more creative ideas for their writing projects in class. Commenting on the award win, Ellie Kennedy, Principal of St Joseph's Co-ed Primary School said "We have been delighted to have Catherine Ann Cullen come into our school to instil a love of writing in our pupils. She has fully embraced the ethos of St. Josephs and makes her lessons relevant to the children’s surrounding environment which enhances the ‘creative writing spark’ in them. Our pupils love seeing her every week and thoroughly enjoy the poems she writes for them which in turn inspires them to write and think creatively also. We are extremely lucky to have Catherine Ann in our school. Also commenting Julian Yarr, Managing Partner at A&L Goodbody, said: "It's fantastic to see the success of this programme. The children are really benefitting from Catherine Ann's passion and creative talent. We are delighted to be supporting this innovative initiative that builds on and complements our ongoing work with Suas to improve literacy levels in our local area"